Description: A beautiful accessory for the home or office. Shiny nickel plated finish with alarm. 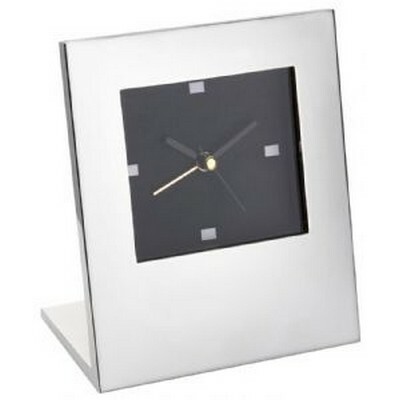 Features: Quartz desk clock with alarm and black face, L-shape. Engraves silver. Supplied with AA battery. Packaging: Wrapped in tissue paper ?in a polybag and presented in a plain black 2 part gift box. ?Packaging Size: 185mm(h) x 150mm(w) x 90mm(d) Colour: Silver. Material: Shiny nickel finish Product Size: 117mm(w) x 126mm(h) x 57mm(d) Freight details : 20 per carton, 9.46kgs, 40 x 32.5 x 46cms; Decoration Type(s): Colour Print / Full Colour Print / Laser Engrave / Print with Dome Decoration Area: Laser: 30mm(w) x 20mm(h). ?Pad: 60mm(w) x 35mm(h). Price includes : 1 Colour 1 Position Print. Setup is included.